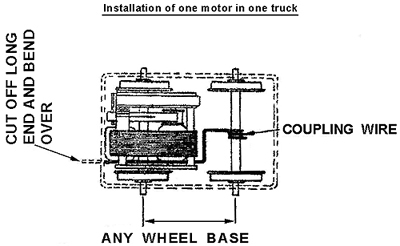 using two motors in one truck. is provided to keep the units from rotating and to provide flexibility. See diagrams below. Note: If car runs in the wrong direction, reverse brush connections. 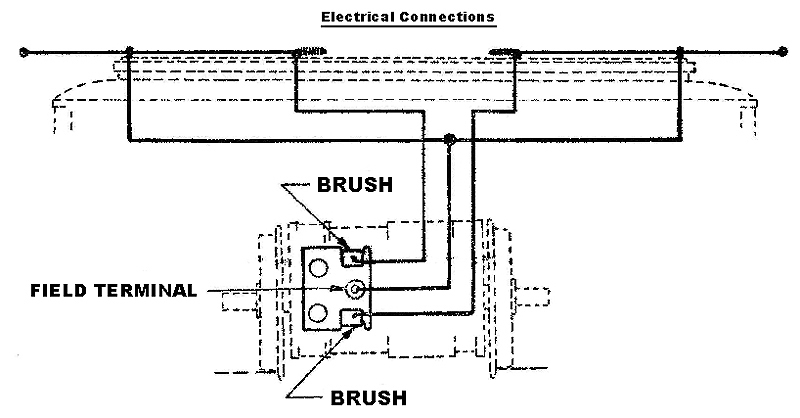 The above diagram shows connections using pole reverse. When using reverse lever, connect in the usual way. These are precision built units and require proper care and lubricationto insure long life and good performance. Lubricate frequently with a good grade of light oil. Lift one of the dust covers and drop the oil onto the gears over the shaft centers as as to allow it to flow down to the bearings. Also oil bearings on opposite side. Remember a drop in the right place is as good as a gallon. The overall length of the wheel axles are to NMRA standards. They may be too long should you wish to have your truck frames closer to the wheels. To overcome this, simply file off each end of the axle to the desired length. Thanks is due to Roger Somers for providing this information. It is with his permission that it is reprinted here. Editors Note: Multi-Units are no longer in production, and haven't been for about 40 years or so. This information is presented here for anyone finding them on the secondary market. For a short history of the Multi-Unit please click here.